These are the sort of conversations young people of color like me who aren’t in Ferguson, Missouri are having. We wonder about how objects, like the bag of Skittles in Trayvon Martin’s hands and the box of cigarettes that might have been in Michael Brown’s, can justify the murder of kids who look so much like us. In Ferguson, Missouri, the execution of an unarmed black teenager has been followed by police action, rioting, and a ban on aircraft above the city. 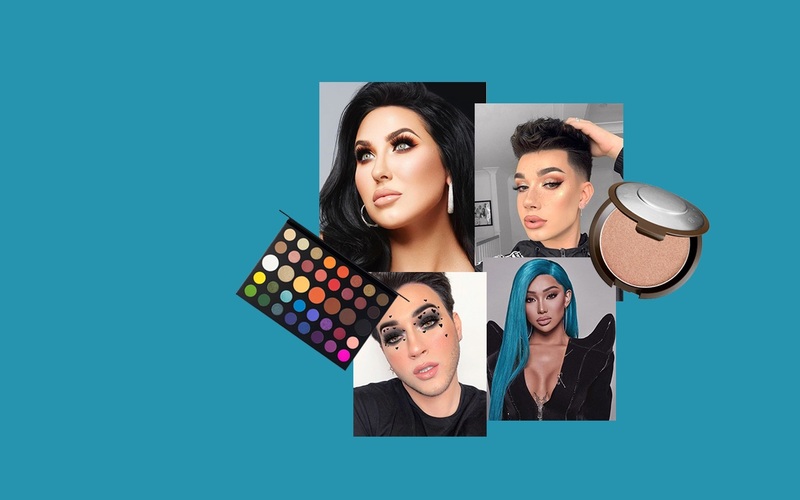 While large media outlets pick at facts and autopsies, people all over social media are tackling deeper aspects of the issues, like self worth. My dashboard on Tumblr is flooded with messages about what’s happening. They range from messages of fear and concern to people sharing information on how we can help those on the ground and in danger. Over Twitter, I see images spread daily of protesters walking with their hands above their heads, getting tear gassed, and sometimes even shot. 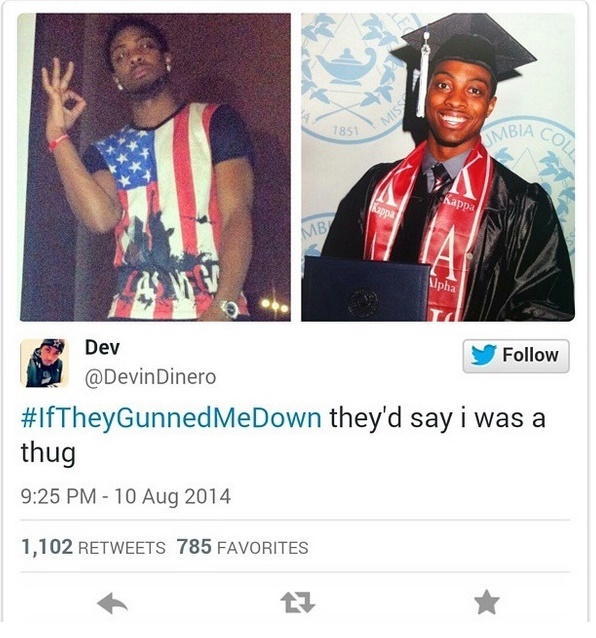 One of the most powerful trends I’m seeing is the #IfTheyGunnedMeDown hashtag campaign. Each image is powerful, because it asks a serious question. How does the media portray the victims of police violence, who are all too often young black and Latino men? And how does that factor into the discussion of race in America? Still, that power hasn’t resonated with everyone. 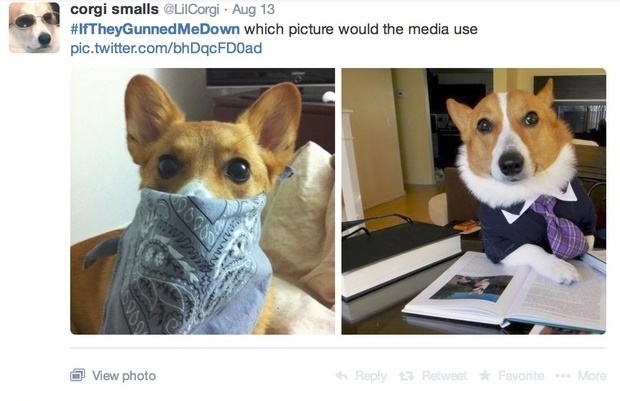 Some have turned this social discussion into a meme, throwing in images of animals and pictures where they are dressed up in a “thuggish” way. I don’t find these images funny at all. The people posting them are using so-called humor to derail a conversation lots of white people aren’t comfortable with. I was excited to see young black people having a conversation about the media’s portrayal of youth murdered by the police. The attempts at humor felt invasive. Even though Twitter exists in cyberspace, which is open to everyone, I wish people would remain respectful when a conversation, even one online, doesn’t revolve around them. 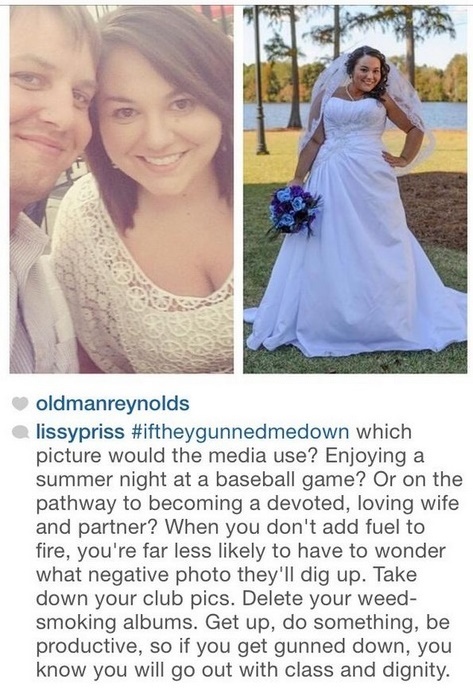 Many people, like lissypriss (right), seem to think that if you don’t want pictures of yourself dressed in baggy clothes, carrying an airsoft gun, or looking disorderly, taken out of context — you shouldn’t post them. And if you do, then those posts can and will be used against you. To me, that idea is ludicrous. Often, we don’t have much control over what pictures of us are online. Young people in particular are tagged in a million things on Facebook. But it’s this sort of attitude coming from people, including older people of color, that if you don’t step out of line and you act “appropriately,” this wouldn’t even be an issue. It’s Respectability Politics at its core. There’s a very prevalent viewpoint in American culture that in order for a person to be worth something, they must always follow a certain code of conduct in order to fully achieve human status. Typically, these behaviors follow the narrowly defined puritanical ideas of majority culture. In other words, the “whiter” one acts, the more human they become. As a teenager, making it through my daily life is hard enough just trying to figure out how to grow into an adult who can support myself. But while I share that experience with my white friends, very few of them have to think about what they are worth, what they’re wearing, and what they have in their pockets before even stepping outside of their homes. I am, as Obama referred in his speech on Monday, both an object of fear, and the one who is afraid of being held up to a ridiculous code of conduct. 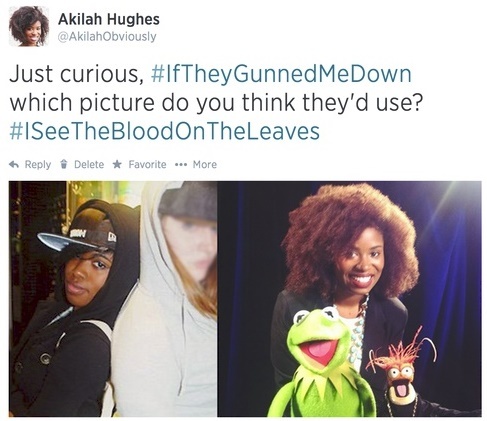 It is my sincere hope that projects like #IfTheyGunnedMeDown can change that. 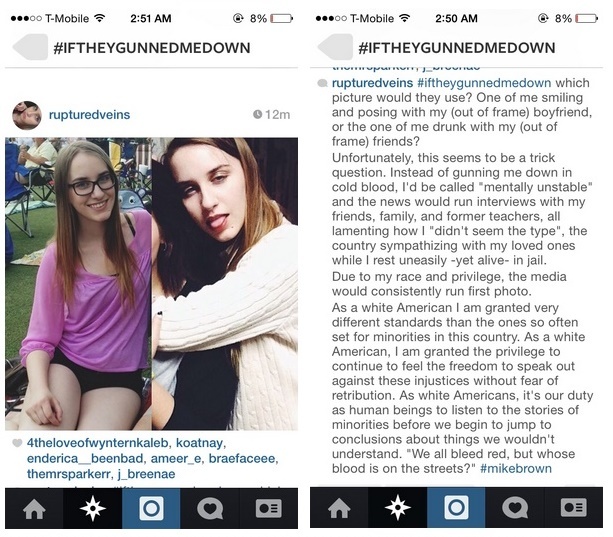 Social media, if used respectfully, can bring up social and cultural issues and help people understand them. And understanding and empathizing with another person’s problems is the first step towards changing things for people of color like me. And sometimes, that means thinking twice before you post — or recognizing when it’s better not to say anything at all. For more on respectability politics, check out The Root’s coverage here.